One lucky 13WMAZ viewer will take the trip of a lifetime in less than two weeks. The Twiggs County woman won all expenses paid trip to the 2016 Grammy Awards. "I didn't think it was gonna happen to me," Stephanie Smith said. It's part of the post-thanksgiving tradition: gearing up to buy your Christmas tree. If you're looking to get one the old fashioned way, then check out Sandy Creek Christmas Tree Farm in Twiggs County. Claire Davis spent the afternoon there to learn more about what the farm has to offer and what families are doing to get ready for the holidays. The Prine family is searching for the perfect Christmas Tree. "One for the living room, one for my sons, the boys' bedroom and then one for the office," said Jay Prine. Many Central Georgia districts saw an increase in graduation rates last spring. Twiggs County had the greatest increase, up 34 points. The state of Georgia says Twiggs County High School's graduation rate is 78 percent. But Superintendent Elgin Dixon said all of his seniors received their diplomas last year. That's because the graduation rate isn't based solely on the senior class, but by tracking students over four years, starting the first day of freshman year. "The number of students that entered into ninth grade that walk through those doors at ninth grade and the number of students that completed all requirements for graduation four years later," Dixon said. He attributes part of the rise in graduation rate to Georgia ending its graduation test requirement, something he's been concerned about for years. 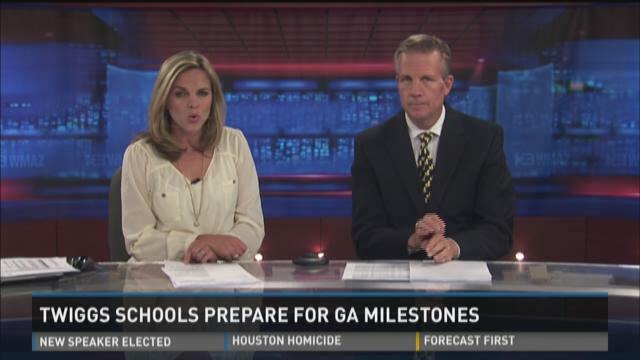 For the second time this year, Georgia students will take the Milestones test. It's a test the state uses to measure whether public schools are improving. It replaces several standardized tests that students took previously. An accident involving two tractor trailer trucks is slowing traffic on Interstate 16 west in Twiggs County. Major James Faulk of the Twiggs Sheriff's office says one truck rear-ended the other, and there's debris across the highway. Nobody was injured, but Faulk says one and a half lanes are closed near mile marker 15. The Georgia State Patrol is investigating. So far, there's no word on charges. There is an ever-present buzzing noise at certain parts of Twiggs County's Middle-High school complex. It may not be music to everyone's ears, but at that school, the low hum is the sound of progress. "It's a complete HVAC renovation. We've pretty much taken the whole system completely out," Mike Harnage with Parrish Construction explains. The company has replaced it with a new $1.5 million heating and cooling system funded in part through a penny sales tax. "We started in mid-March and we'll finish up in about two more weeks, right before school starts," he said. Twiggs Superintendent Elgin Dixon says the upgrades will make the school day more comfortable than the previous 24-year-old system allowed. "They will be cool when it is hot and warm when it is cold," he said. East West Logistics International, a Georgia-California partnership, is planning to construct a 259-acre warehouse in the Interstate 16 Industrial Park in Twiggs County. The company has secured an option to buy the property, according to a news release from the Jeffersonville-Twiggs County Development Authority. The project, which will be constructed in phases, has the potential to reach up to 2 million square feet in warehouse, distribution and light manufacturing operations, the news release states.